Once your account is setup and looks the way you want, you are all set to add courses to your account and also effectively present them to your learners. This will make sure that they can browse through and enroll into courses in a way that best suits your organization. Adding courses to your account. Effectively offering these courses as products, services and product bundles. Considerations: Before we start working on this section, let’s understand few terminologies. Courses: They refers to the courses we create in the LMS. Course type product: This relates to the course we create in your LMS but since they exists in your store/catalog, we refer to them as your products. Service type product: A product in your store having no relation with a course in the LMS. This comes handy when you want to offer a service to the customers which is not offered as course, e.g. one on one training session. Product bundles: When we pack one or more products and sell as a single product, we call them product bundles, this can include product or service or both. 1. 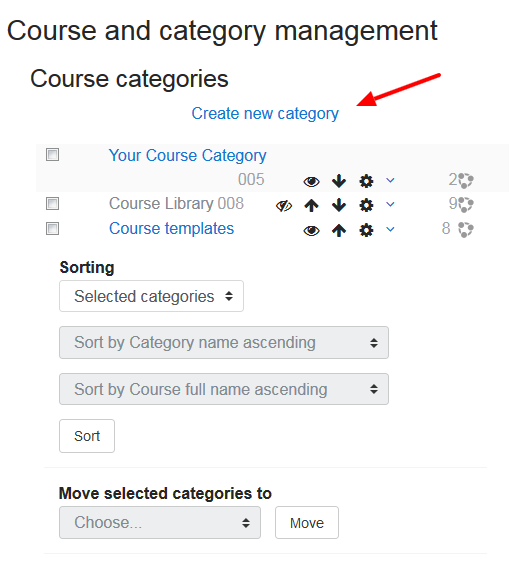 Add category: In ScholarLMS, courses exist in categories. That is the reason we first categorize our courses. Once you are inside your LMS account. 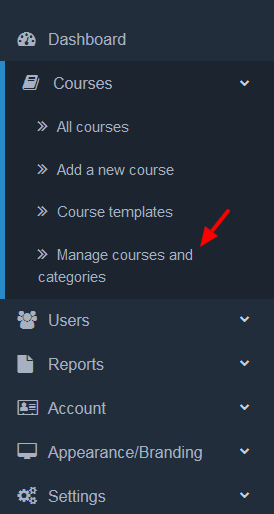 From left navigation, go to Courses -> Manage courses and categories, you should see a category and courses page. On this page click on “Create new category” link. Now you should see the add category page where you can type in category name, and description. Note: Course categories do not sync with your store. Course full name: This is the name of the course. It is displayed as a link on course lists on the Front page and on My home and in Reports. Short name: Many institutions have a shorthand way of referring to a course, such as BP102 or COMMS. Even if you do not already have such a name for your course, make one up here. Course category: The site administrator may have created course categories to help teachers and students find their courses easily. Course start date: This setting affects the display of logs and the weekly format topic dates. Course ID number: The ID number is an alphanumeric field. It has several potential uses. Mainly, with the help of this ID you are going to sync it in the store. The corresponding products in store and course in LMS must have the same ID. Description: Put a meaningful description about this course. Course summary files: Put a featured image of the course, it will be displayed on the home page. Save changes, once you are done filling out these details. You can also add a new course based on an existing course’s template. Read Section 3 for more details. For more detailed documentation about other course settings, read courses settings from our Knowledgebase. 3. Course activities and resources: ScholarLMS offers several ways to serve your course materials to the learners. This can be achieved using various activities and resources available within the LMS. Before adding one, let’s understand the difference between activities and resources. Usually an activity is something that a student will do that interacts with other students and or the teacher. A resource is an item that a teacher can use to support learning, such as a file or link. Now you should see ‘Add an activity or resource’ button on every module. Click on the one where you want to add this activity/resource to. Next you should see a pop up window. For more info about an item, just click on it. Now click on Add button to add that item. There are two ways to sell your courses, one within LMS system and one through the eCommerce store. When you have eCommerce disabled, you can still be able to sell your courses via Paypal enrollment method. Your same courses could be offered as products. The PayPal enrollment method allows users to pay for courses and then be automatically enrolled. For more details on how to setup Paypal enrollment, read this guide. If this sounds like you, then the first thing you should do is to make sure you have eCommerce enabled. You can enable eCommerce by logging into “My account”. If eCommerce was enabled at the time of account setup, all your courses will be automatically synced with the store. 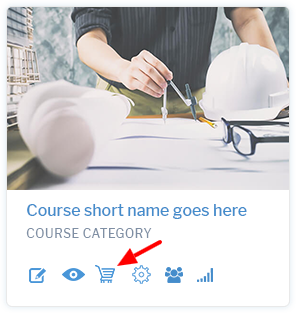 If not, go to the courses page, and then sync that course with store by clicking on the cart icon. After setup, you can further edit this product in store. Now let’s understand how to create a new category, products, services and bundles. 1. Adding a Category: Like in the LMS, the store also has categories. Although, it’s not mandatory to have similar categories in the store, it comes handy for your learners if the LMS and the store look similar. Here is how you can add categories. 4. On first tab “General” fill-in all the details like Category name, description, meta tag title. 5. On second tab “Data” choose parent category (if any), SEO keywords, image and leave all other fields as default. 6. Save the product from the right top ‘Save’ icon. 2. Adding a Course Type Product: Once you have the categories added, it’s time to add products. Here is how you to add a new product. Go to eCommerce->Catalog/Products and click on the right top plus icon. In the second tab “Data” select Product type as Course and then fill-in with the image, model, price, quantity, date, status. One important thing to notice while you fill out the product details is the Model ID on the second tab “Data”. This is the same ID you filled out as the Course ID in the LMS. It’s mandatory to have exact IDs for automatic enrollment of your learners. Note, a course type product can not be added multiple times. The default quantity is set to 1 as it’s synced with one course. 3. Adding a Service Type Product: This process is similar like adding a product, we just need to select Service type. Under “Data” tab select product type to Service, and then fill-in image, model, price, quantity, date, status. Note, a single service type product can be purchased multiple times and the customer will have an option to change it’s quantity. 4. Creating product bundle: Product bundle is a product that enrolls a learner in more than one course after successful purchase. For this you need to enter all the IDs of courses that you want to offer in this bundle. The course IDs must be separated by comma in model number field. Example: if you want to bundle three Energy courses, you can put like Energy1, Energy2, Energy3 in Model field.